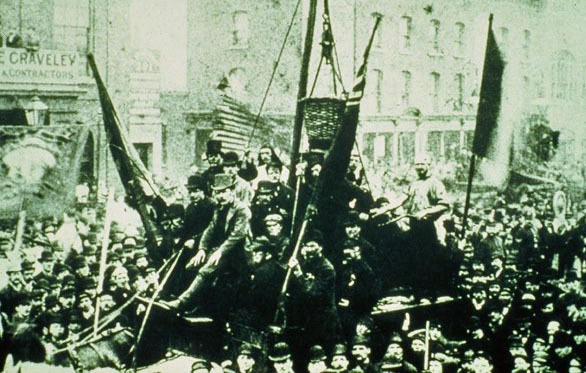 In June 1889, Havelock Wilson's young but rapidly growing National Amalgamated Sailors' and Firemen's Union was organising strikes in various ports throughout Britain. In many places the dock labourers came out too. This is what happened in Glasgow. On June 11th Edward McHugh, a former commercial traveller and friend of Henry George, brought the union he had formed in February 1889, the National Union of Dock Labourers, out on strike in Glasgow. The strike met with a quick response from the port employers in Glasgow. Very quickly blacklegs were brought into Glasgow in considerable numbers from Dundee. The men from Dundee got the police protection they had been promised, and quickly set to work. But they soon left work in a body after the strikers managed to make contact with them and to explain their case. Sixty labourers from Tilbury, brought in by the employers to replace the strikers, turned back for London once they found that the labour shortage they had been going to fill had arisen because of the strike. Similarly, men from Leeds turned back when they discovered the real reason for their being needed. But these small victories for the strikers were not enough. Blacklegs were coming in from all over Britain, and the promise on the company posters that police protection would be guaranteed was being honoured. Edward McHugh and Richard McGhee could do little more than to call for increased picketing. 'Having mastered all the mysteries of the doctrine of value and the distinction between "value" and "price", we were made familiar with the multitudinous forms of orthodox adulteration from jerry buildings and cofin ships to watered milk and shoddy clothes. With only one exception we found the all-prevailing practice to be this, that the "QUALITY" of each commodity, whether it be a dwelling-house, a suit of clothes, or a Sunday's dinner, is regulated according to the price which the purchaser is willing to pay-the one exception being labour. 'We began to ask ourselves and our fellow-members why the "quality" and "quantity" of labour should not be subject to the same law as other marketable commodities. We were witnesses of the fact that a trifling increase in wages was scornfully and insultingly refused to Union men, whilst at the same time inexperienced and consequently inefficient scab labour was imported at enormous cost and trouble, and paid at higher rates than were asked by Union men, and, in addition to higher wages, we saw the scabs delicately entertained and provided with free food and lodging, tobacco, and beer,-the ability to do these things demonstrating beyond the possibility of doubt that the demand made by Union men was a very modest one indeed, and one which the employers could easily have afforded to grant. 'We had the most convincing proof of the lirnited quantity of work done by scabs in the detention of vessels, and of the int'erior quality in the fact that the ships when stowed were pronounced unseaworthy. For these unsatisfactory results the employers paid generously. 'Complaints have been made by the Dock Directors that the men are not working as energetically and heartily as in times past, and in consequence they are not only put to a very considerable expense, but very serious delays are brought about in the departure of vessels.